After running SFC/ SCANNOW, performing a clean boot and about a dozen other standard IT tricks, I found a blog that nailed the issue. It had to do with the Notification Area… yes, I know that sounds stupid but that is what it was and later I found MS documentation to back it up. 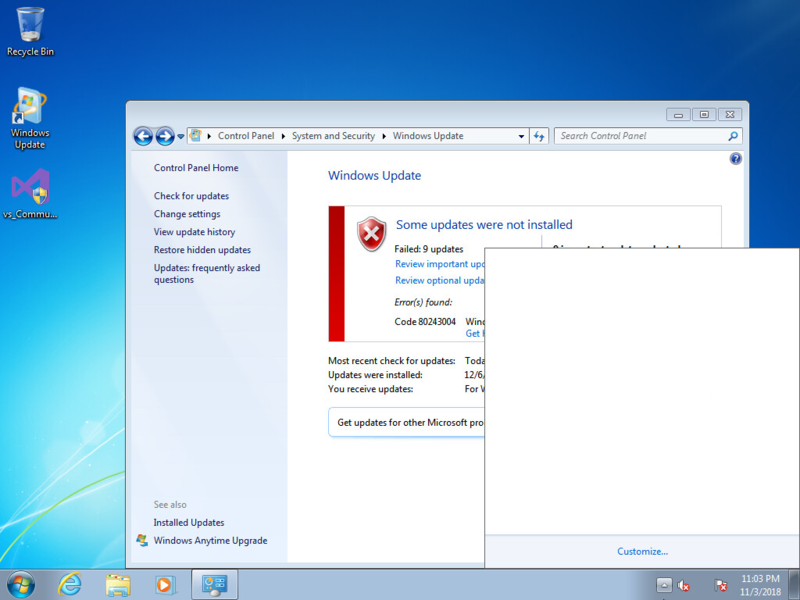 Apparently if the Windows Update icon can not popup in the Notification Area, Windows Update won’t. This allowed about a third of my 20 outstanding updates to install but others still would not. I found that changing to a different profile allowed me to install the balance. even though there is only one version of MSRT! SOLVED, SOLVED, SOLVED, OH JOY! SOLVED: How To Add the Start Button into Windows 8? In an old VM I was updating, I ran into this, and checked the notification tray to find a roughly 16×16 grid of empty icons that vanished as soon as I moved my mouse over them. Rebooting fixed it. Error 80243004 occurred while trying updating Windows 10. Is there any connection of this Error to DNS Server also? Thanks for this one. Problem solved. I tried the five step solution, nothing worked for me until I rebooted the computer. Thanks for posting the solution. I’ve been trying to updated windows for sometime.